Welcome to the NoWcard website, the transport smart card for Cumbria, Lancashire, Blackburn with Darwen and Blackpool. NoWcard has been set up jointly by Cumbria and Lancashire County Councils; and Blackburn with Darwen Borough and Blackpool Councils. Working closely with bus operators and other agencies, each local authority will be issuing NoWcard English National Concession Travel Passes and equipping buses with new upgraded ticket machines all under the NoWcard banner. To renew your pass or to check on the progress of your application please click here. From 1 February 2018 bus ticket machines will indicate if a NoWcard pass is valid for travel. 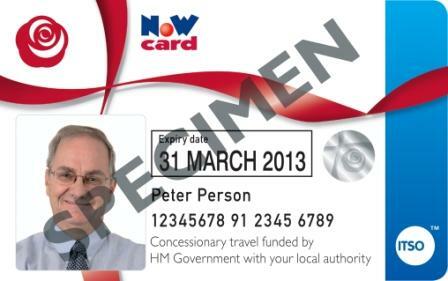 Can I apply for a NoWcard English National Concession bus pass? I have changed address, how do I inform you? How do I apply for a NoWcard English National Concession bus pass? What do I need to do if I lose my NoWcard? What should I do if my card won't work on the card reader on the bus? What 'Express' services in Lancashire and Cumbria can I use my National Concession bus pass on? What concession does a NoWcard English National Concession bus pass entitle me to? If you have any queries not covered in the frequently asked questions (FAQs) or on the website please contact us.